The history of Gervais School District No. 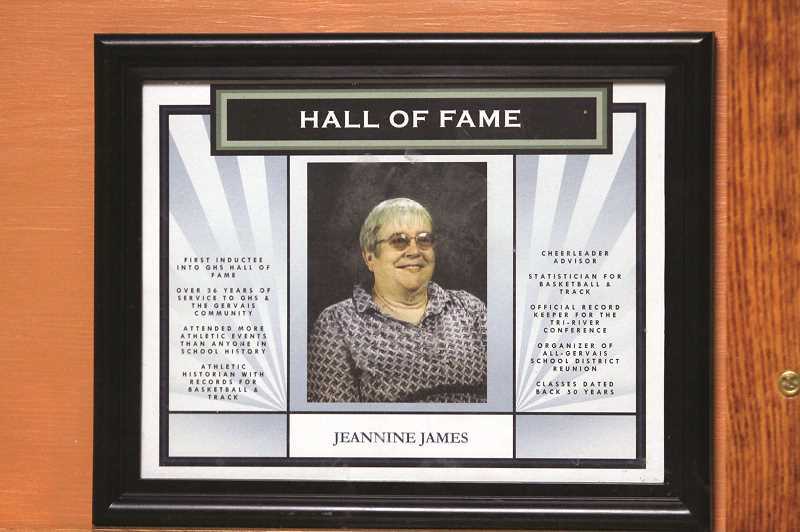 1 dates back to more than 100 years, and in that time, no one has become more synonymous with the district, its high school and the Gervais community than Jeannine James. A longtime sports historian at Gervais High School, James was honored at halftime of the Feb. 5 girls basketball game against Culver for 50 years of dedicated record-keeping. 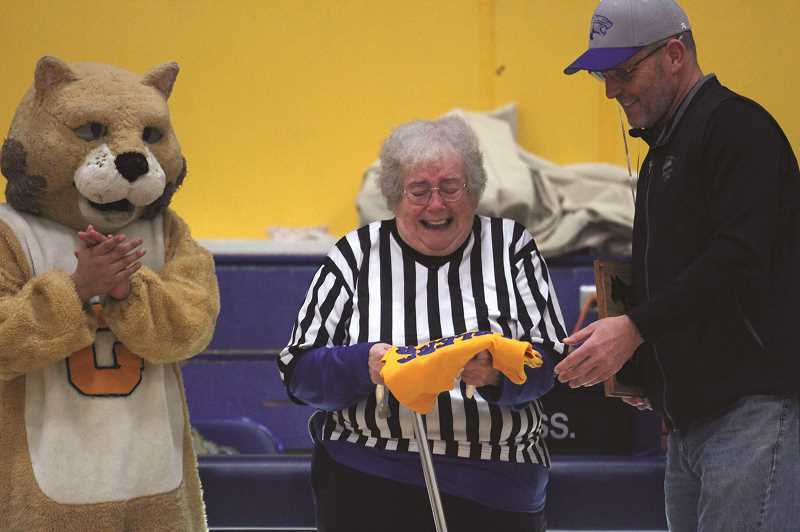 Hundreds of fans spanning generations of classes came out en masse to support James' decades of service to the district, cheering as she was gifted a celebratory plaque in front of the towering Cougar mural that dominates the gymnasium. "It's amazing," James said following the recognition. "I do appreciate it." James came to Gervais High School when it was known as Gervais Union High School in 1969, filling the post of librarian after teaching four years at Pacific High School in Port Orford. 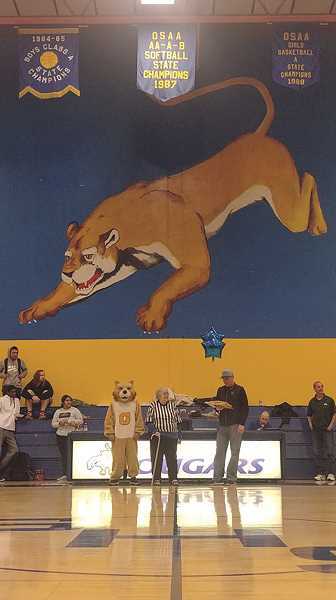 The Cougar mural had been painted just a few years earlier, and James recalls former principal and superintendent Bob Glasscock eagerly showing off the artwork when she came up to apply for the job. "When I came to interview, the first thing (they did) was to show me the Cougar on the wall in the gym," James said. "They were so proud of that." Shortly after James was hired, the 1969-70 boys basketball season tipped off. 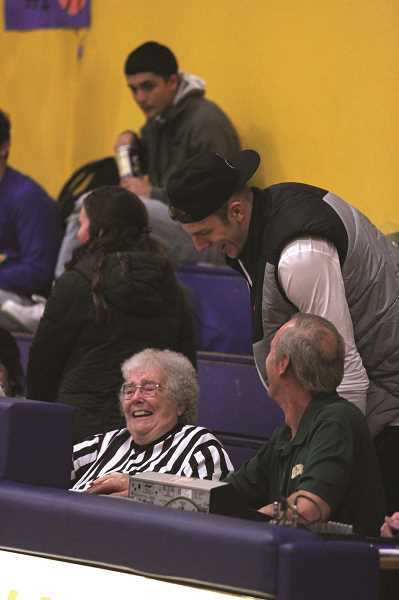 The Cougars were without a scorekeeper and James volunteered to keep stats, having done previously at Pacific. 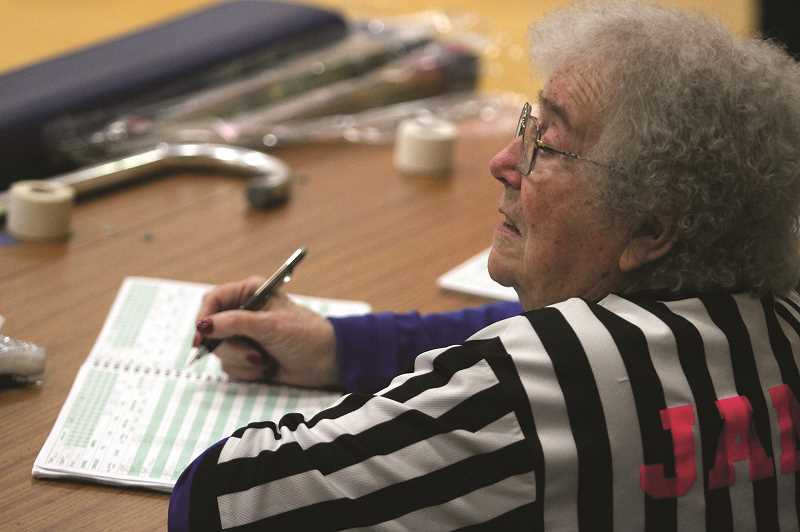 After the conclusion of the season, she transitioned her scorekeeping duties over to track and field. James' interest in track and field began in college at Southern Oregon University, and she began taking stats in her time at Pacific. Part of her interest lies in the nature of the sport itself, with multiple events taking place at one time, giving spectators a several things to see at once. But she also enjoys the casual atmosphere of a track meet. With kids warming up as they wait between events, it gives James an opportunity to get to know the students outside of school hours. "You have time to talk to the kids and I enjoy talking to the kids," James said. "People say how the kids have changed. Yeah, overall, as a group the kids have changed, but one-on-one they're still kids." Over the years, James continued to become more involved with the high school. She would supervise study halls and led the yearbook and photography classes. She was the adviser for the cheerleading team before there were girls sports (except track). She served as women's high school editor of Track & Field News for two years. 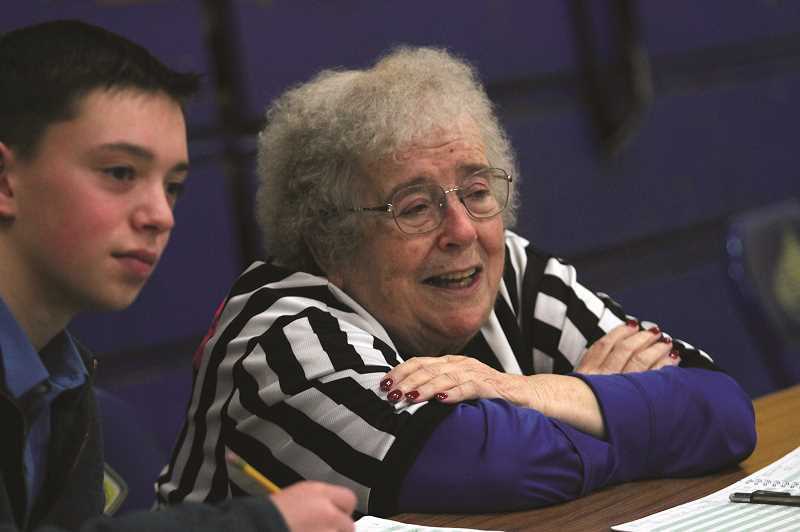 When girls athletics were added in the 1970's, she helped keep stats for those as well though often times the boys and girls basketball teams would play at opposite venues, in which case she would stay with the boys teams. In the decades following, James has seen the basketball programs rise and fall with various classes, peaking in the 1980's when the Gervais boys and girls combined to go to six state championships in a from 1982 to 1988. The most memorable of which was the 1982 boys state championship game when the Cougars were still an AA team and played for the title against Marist at the University of Oregon's McArthur Court in Eugene. 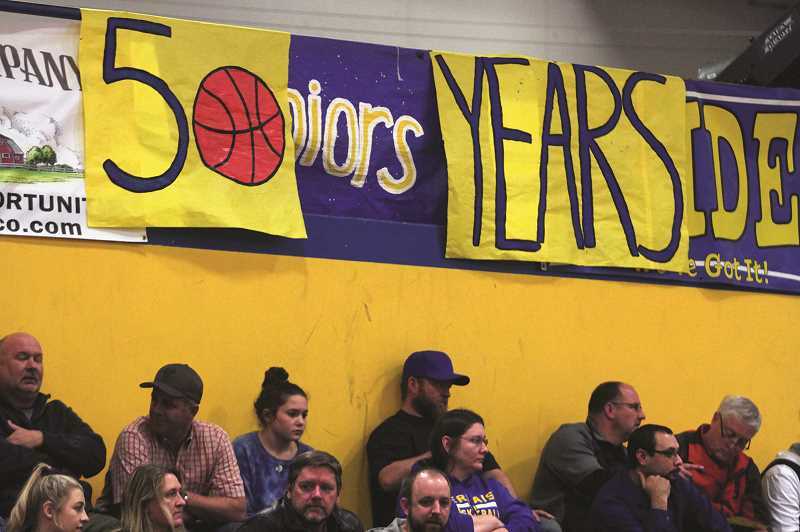 Though Gervais went on to lose the game 41-36, the nearby location allowed alumni from various years to pack the gym, creating a raucous atmosphere she still remembers today. "People who graduated from Gervais were coming out the walls," James said. She continued to serve at Gervais High School through the 1990's, keeping records during a boon in the schools girls athletics programs that brought home a perfect state championship basketball season in 1994 and a runner-up volleyball season the year before. After 33 years at Gervais, she retired in 2002, but that was just the beginning of the next stage of her career. James saw the transition of print records to digital records — a change she celebrates. "It made what I did so much easier," she said. "After every game — I would go to the game, then I'd take the scorebook into the staff room and call the Statesman (Journal), and give it all to them vocally." While the coaches keep the official stat book from each game, James has detailed catalogs of statistical information from each season, including season totals of every player along with All-State and All-Conference accolades. Although she hasn't undertaken the enormous task of tabulating career totals for players, anyone could do so given enough time to go through the records — which she keeps backed up for good measure. "They're on the computer, but I have them also on paper," James said. "If the school burnt down, there's a set at school and a set at my house, so if one burns there's another set." Her dedication to all things Gervais made her the natural choice to become the first person selected in the inaugural Gervais School District Hall of Fame in 2006, a program which she now naturally runs. Though she is now nearly two decades past her retirement, she has no intention of stopping any time soon. In addition to her continued keeping of the books, James also mails progress reports and report cards to parents and is the first person to greet parents at the door for conference night. Jeannine James is the official, unofficial ambassador of the Gervais School District, and no one would have it any other way. Why we LOVE Love Inc.